Eric works in the afternoons, which meant we had to arrive at Costco as soon as the store opened. Even with the early arrival, we only had about an hour to browse, pick, and purchase. That’s like ten-minutes in normal-store time. And one-ride in Disneyland-time. Samples do not begin until 11AM. We do not have a car, so we took the subway. Costco is approximately 100 blocks from Eric’s apartment. Travel took up a good chunk of time. We do not have a car, so we had to carry our groceries back to the apartment. If you have ever been to Costco, please imagine carrying your groceries back because you lack vehicular transportation. Luckily, we took the subway for a long stretch of the journey, but one mile feels a lot longer when you are carrying 25 pounds of rice and 36 rolls of toilet paper. Seriously. Eric bought 25 pounds of rice! These are only the big hitters. We also bought peanut butter, pasta sauce, quinoa, ziploc baggies, meat, more meat, cheese, and chocolate chips. Though I was unsure we would be able to carry it all back, I didn’t say anything because Eric’s calm demeanor left little room for argument. 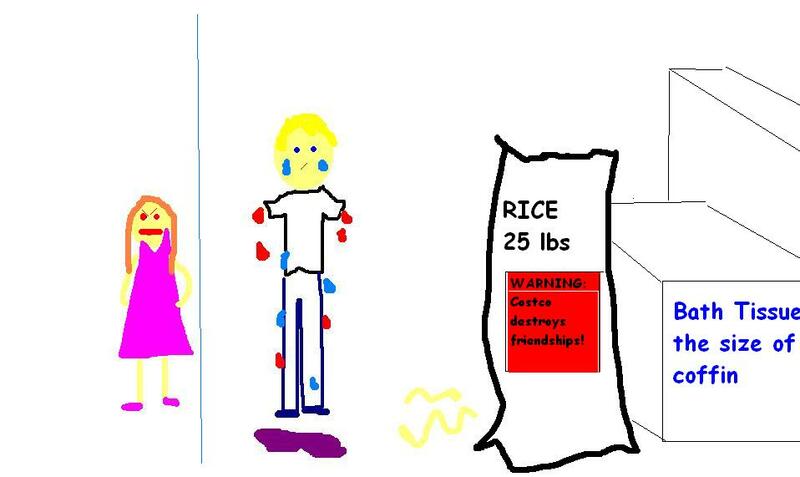 In his defense, Eric thought it was five pounds of rice, not twenty-five. 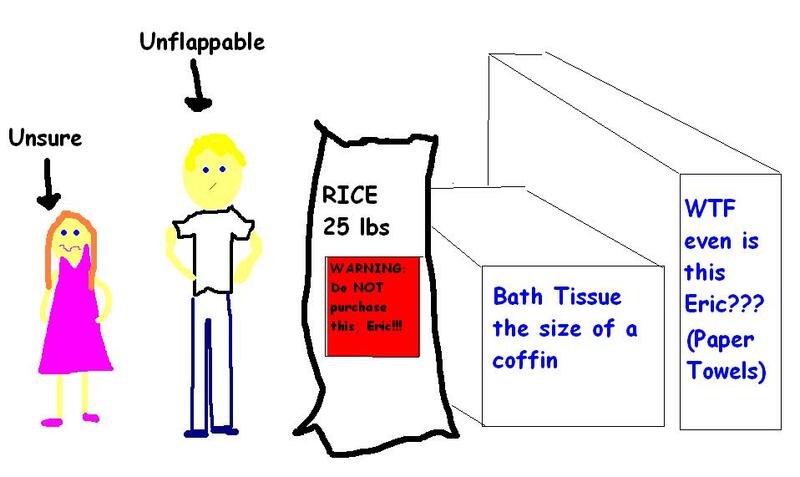 Eric carried the rice and other groceries, while I buried myself in the coffin-sized tissue. We walked to the subway. It was about ten minutes on the way there, and ten times that on the way back. Probably because we walked in circles and backtracked. Upon arriving at our destination, we hauled the groceries to Eric’s building. We shed a few tears, but found the strength to carry the groceries up the five flights of stairs to the apartment. Fiiiiive fliiiights of stairs. When we finally reached his apartment, I was only grateful to be alive. Haha, just kidding. I was mad and tired, and drew an invisible blue line between Eric and me to represent the icy anger that now permeates our friendship. Eric was not angry, probably because he was in shock after his arms fell off. Afterward, I took a much-needed lunchbreak, and am now packing my belongings and dragging them back up the exact same path so I can move into a room of my very own! Claiming Eric’s couch has been fun, but now that he has so many paper towels and rolls of toilet paper, I don’t think there is room for me.